Flat Steel Pallets with flat sheet steel deck or slatted steel deck. 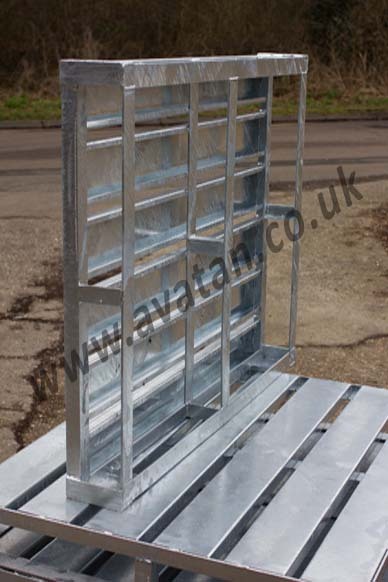 This four way entry pallet option, available with hot dip galvanised or painted finish, is fully reversible but may also be supplied single sided with optional full perimeter lip to minimise contents slippage. Alternatively fitted with conventional stacking feet or skids. Standard units with slatted deck suitable for 1000kg u.d.l. per pallet using 152mm formed steel planks leaving a gap of approximately 56mm between planks. Other sizes are available. Inset pictures show Steel Pallet with close boarded slatted top deck, (minimal gaps) and Galvanised Steel Pallets with hot dipped galvanised finish. Any size and quantity.